A LEGO world record was broken in Sao Paulo, Brazil this month when 6,000 people -- most of whom were kids -- got together to build the tallest LEGO tower the world has ever known. They pushed Chile's previous world record out of the top spot by building a 102 foot, 3 inch tower out of individual LEGOs, with the help of a very tall crane. There were 500,000 individual LEGOs in the tower and it took the group four days to assemble the giant monolith. When it was finished it was held in place by wire supports, but still swayed from side to side over the nearby highway. Not only is this an example of what kids can do with their powers combined, but also a great learning experience for those involved. Kids were able to take part in building something truly amazing while learning about structure and building basics in a way that they can understand. We’ve got to congratulate the adults that put this thing together and have to say it’s definitely one of the most impressive playtimes we’ve ever seen. 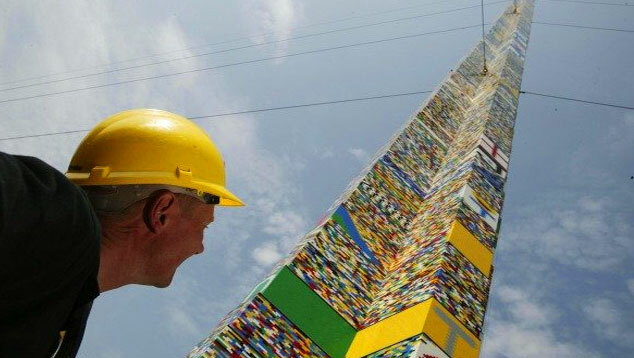 Brazilian Kids Build World's Tallest LEGO Tower - 102 ft! There were 500,000 individual LEGOs in the tower. It took the group four days to assemble the giant monolith. What a great example of what kids can do when you allow them to combine their creative energies. They were able to take part in building something truly amazing while being versed on structure and building basics that they can understand. We’ve got to congratulate the adults that put this thing together and have to say it’s definitely one of the most impressive playtimes we’ve ever seen. Before Brazil held the record, London was the first to build a LEGO tower and then Toronto, Moscow, Sydney, Tokyo and Munich followed in their footsteps. We wonder who will topple the record next and how high they'll go?